The Dolphins got back in contact with Lawrence Timmons on Sunday, but he wasn't at their game against the Los Angeles Chargers. CARSON, Calif. (AP) — Linebacker Lawrence Timmons is inactive for the Miami Dolphins’ season opener after he unexpectedly left the team one day before the game. The Dolphins got back in contact with Timmons on Sunday, but he wasn’t at their game against the Los Angeles Chargers. Dolphins coach Adam Gase will discuss Timmons’ situation after the game, team spokesman Jason Jenkins says. 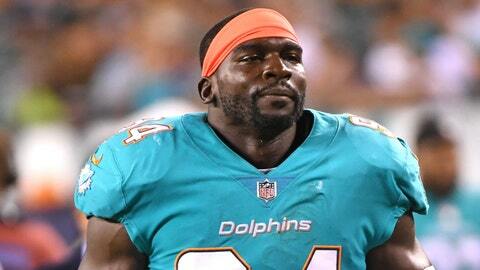 Timmons was expected to start for Miami this season after signing a two-year, $12 million deal. He spent his first 10 seasons with Pittsburgh, winning a Super Bowl ring in February 2009 and making the Pro Bowl in 2014. The Dolphins have been in California for nine days, leaving South Florida early to avoid Hurricane Irma. Their opener against Tampa Bay was postponed.